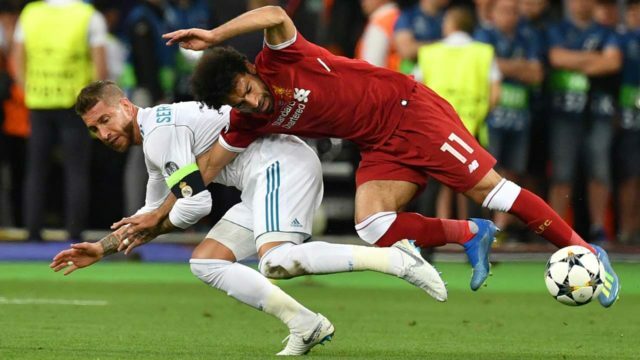 Mohamed Salah faces a race against time to play for Egypt in the World Cup after Liverpool's physio said he faced three to four weeks out with the shoulder injury suffered in the Champions League final. The Liverpool forward sprained ligaments in his shoulder during Saturday's defeat to Real Madrid. Speaking after the game, coach Jurgen Klopp described it as a "really serious injury," but the Egyptian Football Federation said it was optimistic that he will be ready for their World Cup opener against Uruguay on June 15. "He is sad about what happened but is totally focused on recovery, seeing when he can be ready," physio Ruben Pons told Marca. "In principle it will be between three and four weeks, but we will try to reduce those dates -- that's the big goal." Egypt play hosts Russia, on June 19, and Saudi Arabia, on June 25, in Group A, meaning that a four-week recovery would leave Salah ready for the group stage if Egypt get there. Salah has travelled to Spain to undergo treatment, the Egyptian federation said. He has been seen without a sling as he undergoes treatment, footage recorded by El Chiringuito TV shows.